Air Force One touched down on the tarmac at Ben-Gurion International Airport shortly after 12:30 p.m.Monday. 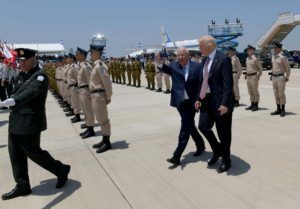 The landing represented the first direct flight ever between Israel and Saudi Arabia, the first stop of Trump’s first international trip as president. 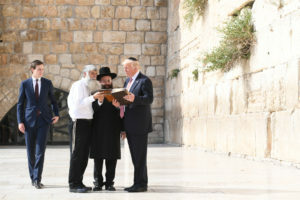 “I have come to this sacred and ancient land to reaffirm the unbreakable bond between the United States and the State of Israel,” Trump said in remarks at the welcome ceremony after he reviewed the honor guard and was welcomed by Israel’s leaders, Prime Minister Benjamin Netanyahu and President Reuven Rivlin. He called his visit to the region a “rare opportunity” to bring peace and stability. “But we can only get there working together. There is no other way,” he said. 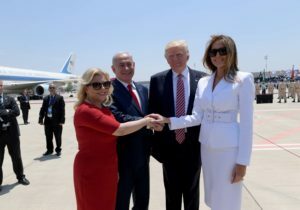 Netanyahu called the visit historic in that it is the first time that a U.S. president’s first trip abroad includes Israel. “Thank you for this powerful expression of your friendship to Israel,” the prime minister said. 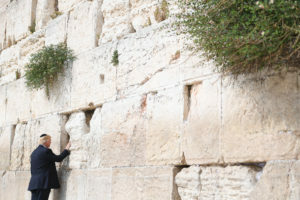 In another first, Trump visited the Western Wall in Jerusalem, becoming the first sitting U.S. president to go to the holy site. Netanyahu alluded to Trump’s speech to Muslim and Arab leaders in Riyadh the previous day. “Mr. President, yesterday in Saudi Arabia you delivered a forceful speech on terrorism and extremism, called on forces of civilization to confront the forces of barbarism,” he said. 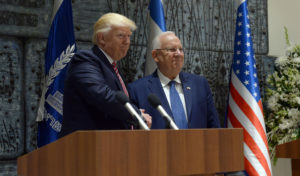 Speaking before Netanyahu, Rivlin said the Middle East and Israel need a strong United States, and the United States “needs a strong Israel.” He reminded Trump that Israel this week marks the 50th anniversary of the reunification of Jerusalem. Trump’s daughter Ivanka and son-in-law Jared Kushner landed in a second plane and sat with the American diplomatic delegation during the welcome ceremony. During a live video feed of Trump’s visit to Israel, the White House caused a bit of a stir by identifying the location of the president as “Jerusalem, Israel” — a departure from the standard listing of the city as simply Jerusalem. The caption appeared on the video feed of Monday’s news conference at Israeli Prime Minister Benjamin Netanyahu’s residence. It came as Trump administration officials continue to differ over whether to describe the contested city as being part of Israel, and as Israeli officials urge the White House to move the U.S. Embassy from Tel Aviv to Jerusalem.